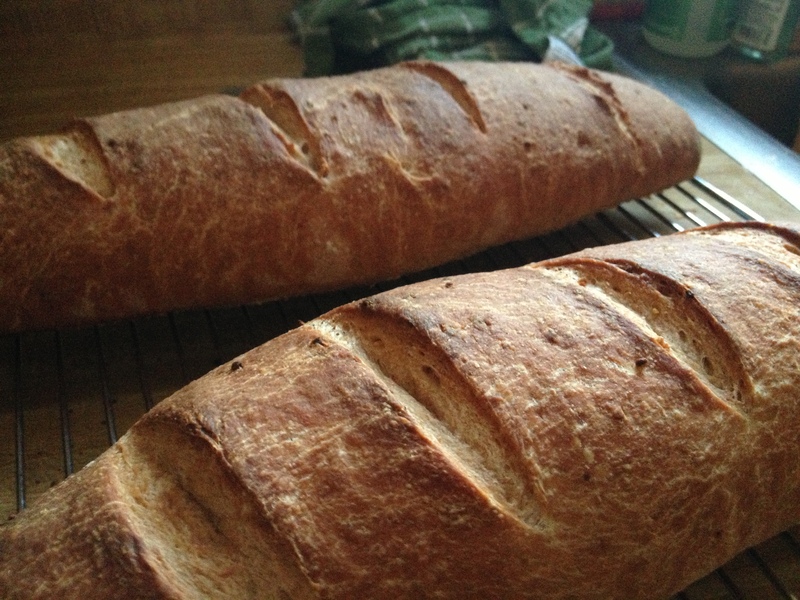 As promised I will be sharing recipes for French bread and tomato soup! The soup is easy and delicious, the bread is a bit harder to make but can be accomplished even by novices! 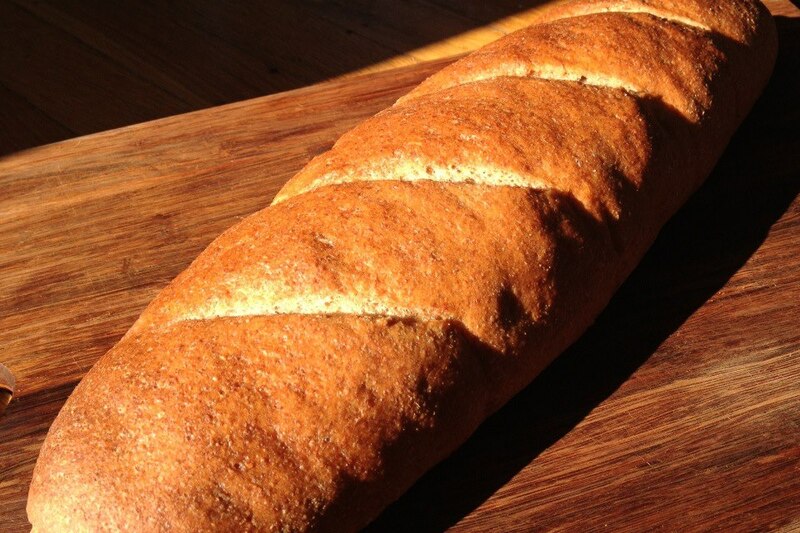 I have been looking at French bread recipes forever, and here is what I find to be the simplest method! A food processor works wonders for this recipe, but a kitchen aide or good old arms work well too! A kitchen aid stand mixer or my preference, a food processor both work wonders. 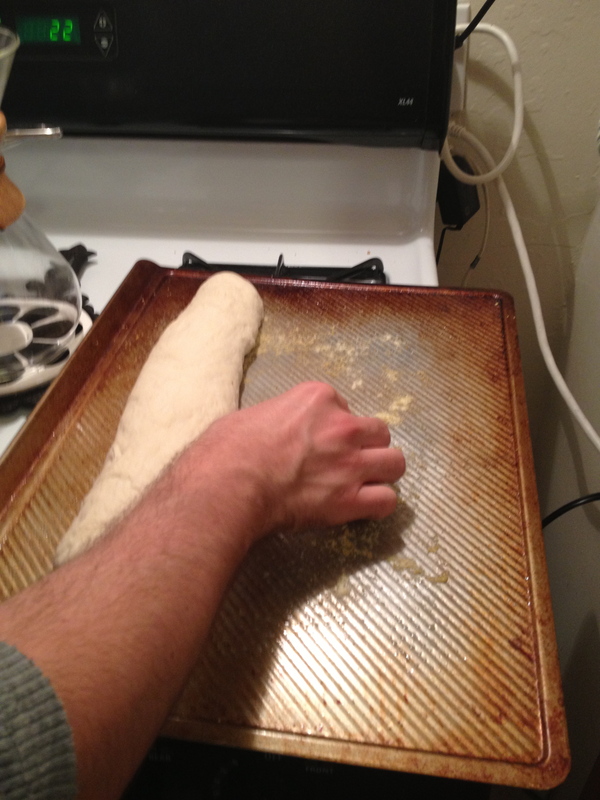 I have links to kneading bread by hand below if you have neither! A dutch oven, or tray that can be preheated so you can pour boiling water over it to create steam. 1. First measure out 2 1/4 tsp yeast and place in a large liquid measure such as pyrex. Add 1 cup warm water (too hot and your yeast will be killed before it even has a chance), and 1 cup of BREAD flour even if using whole wheat. Stir with a fork until all ingredients are well incorporated. 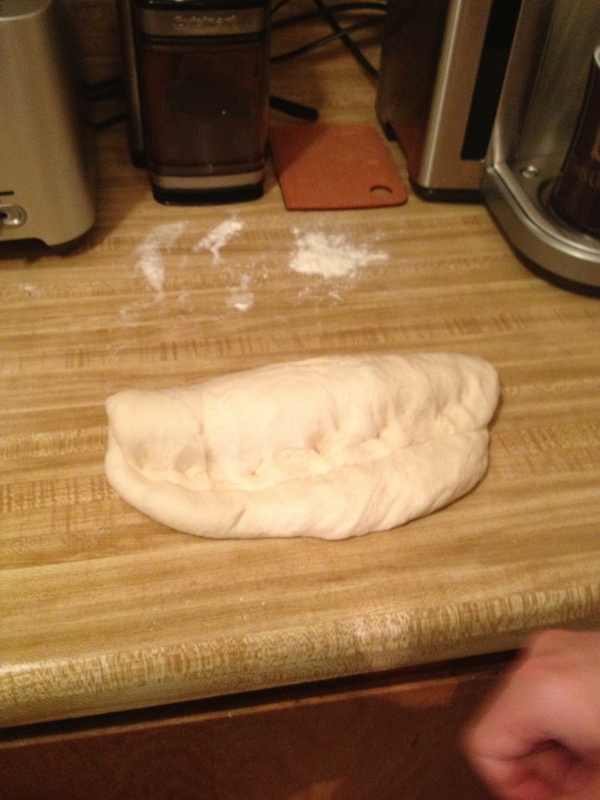 Let sit for 15 minutes until bubbles form at the top and it starts to look foamy. 2. In the meantime put the remaining 4 cups of flour in the food processor with the bread dough attachment, kitchen aid bowl, or large mixing bowl. Add the salt and pulse or mix until combined. 3. Pour the yeast mixture into the food processor and fit lid. Turn on and add remaining 1 cup warm water and run the food processor until you have yourself a ball of dough (more of a lump, there is too much dough in this recipe to form a ball. 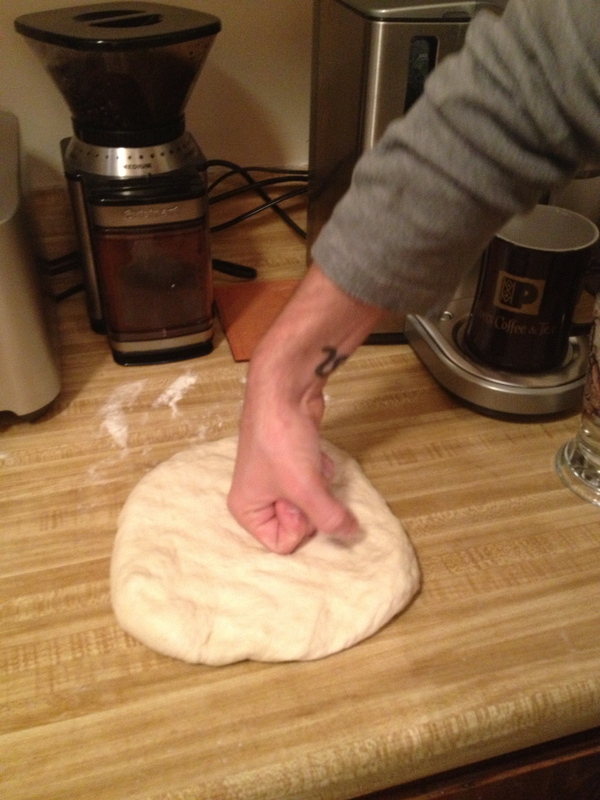 The dough should be a bit sticky and pass the windowpane test. 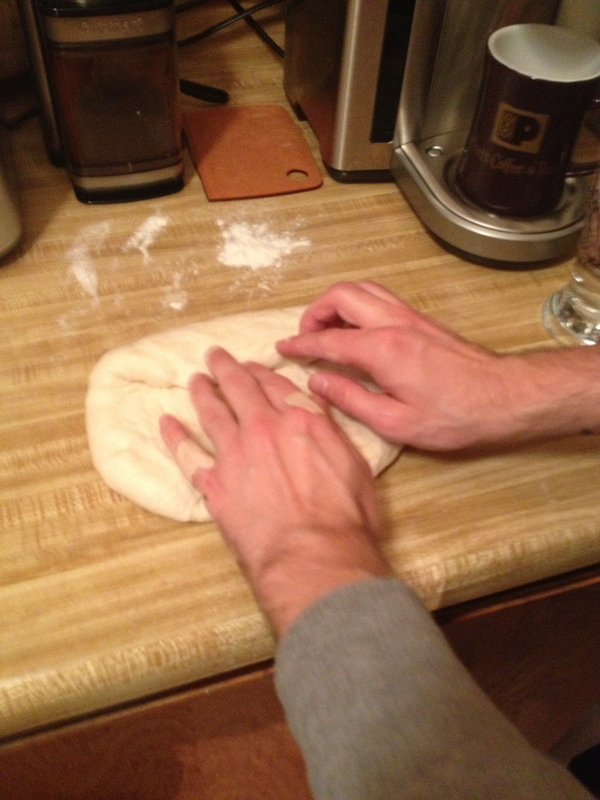 If you are kneading by hand follow those techniques. 4. 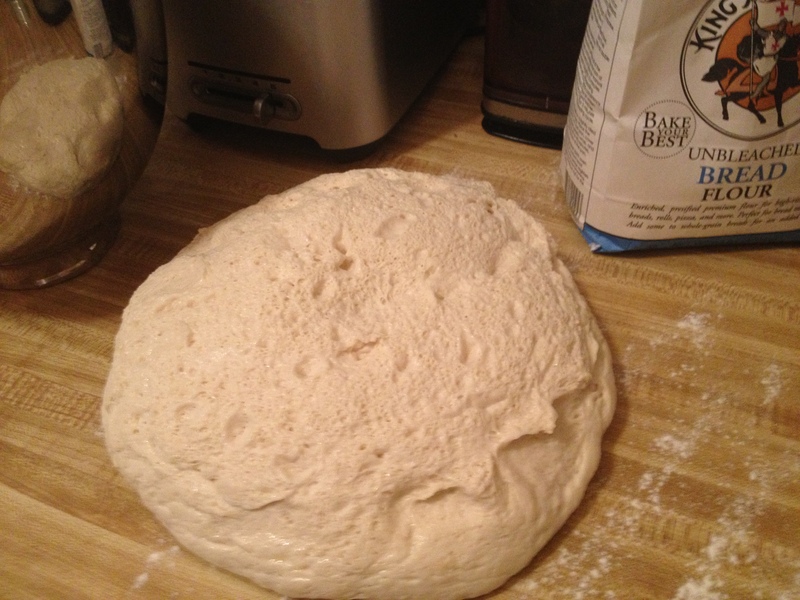 Oil a large bowl (I use organic canola oil spray) and add the dough rolling it into an imperfect ball. 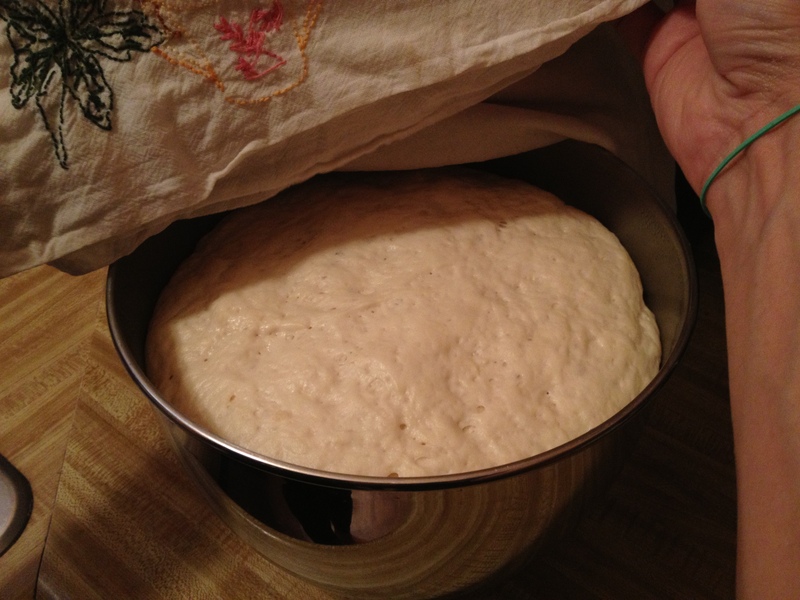 Cover with a damp towel and let rest for at least two hours. 5. 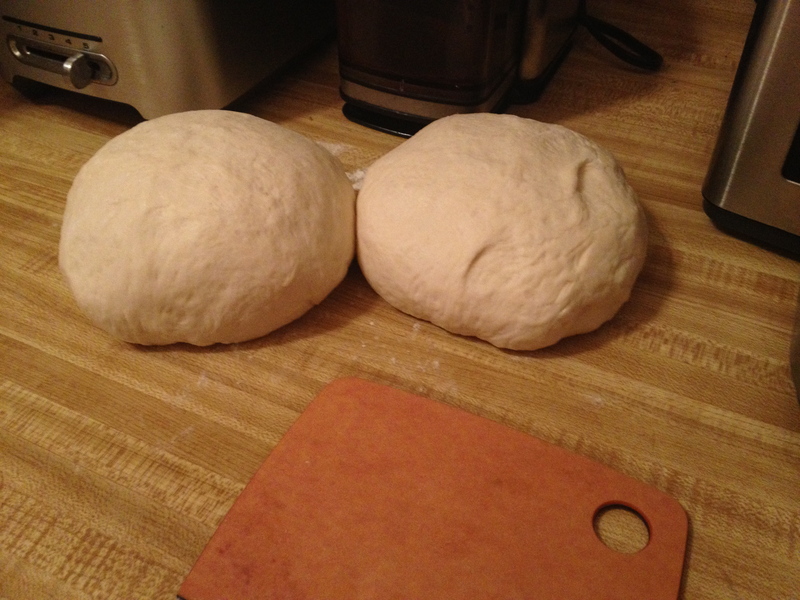 The dough should be over double in size. 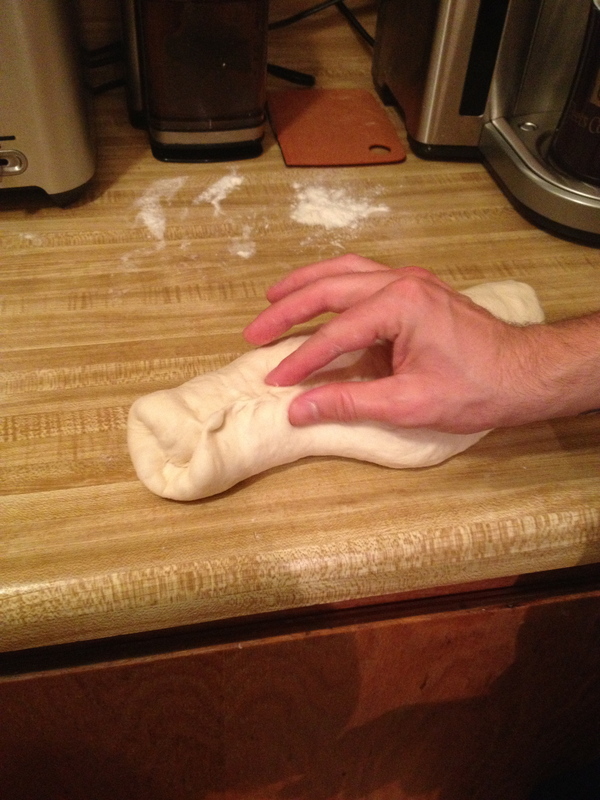 Take it out of the bowl and place on a lightly floured surface. 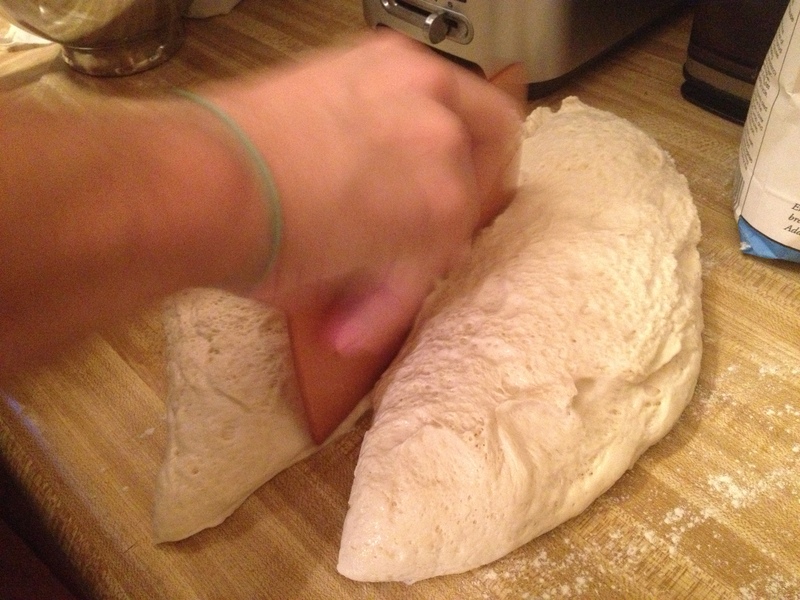 Cut the dough in half and roll each piece into a ball. Punch one of the balls down into a 6 inch round. Fold over and press to seal, continue to do this until cylindrical. 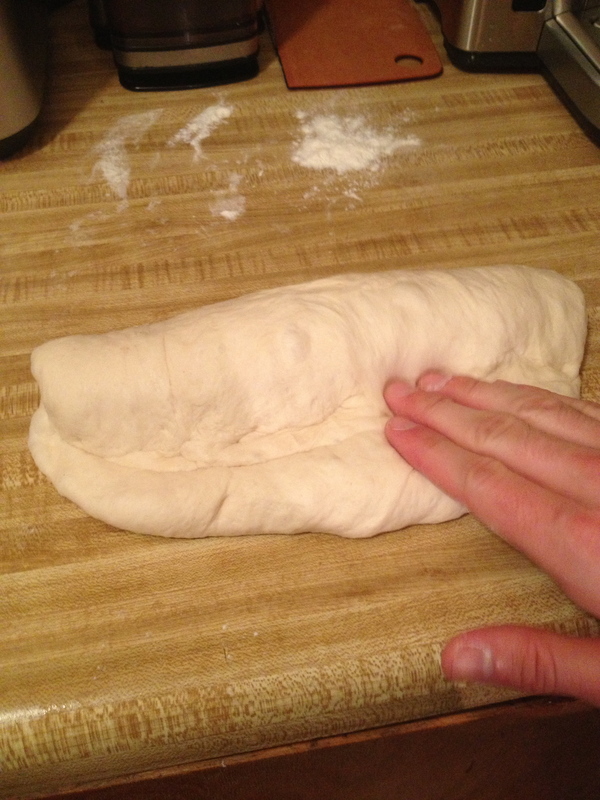 Turn the bread over and roll the dough out so that the middle is big and gradually declines to the end and then place on baking sheet prepared with grease and cornmeal. 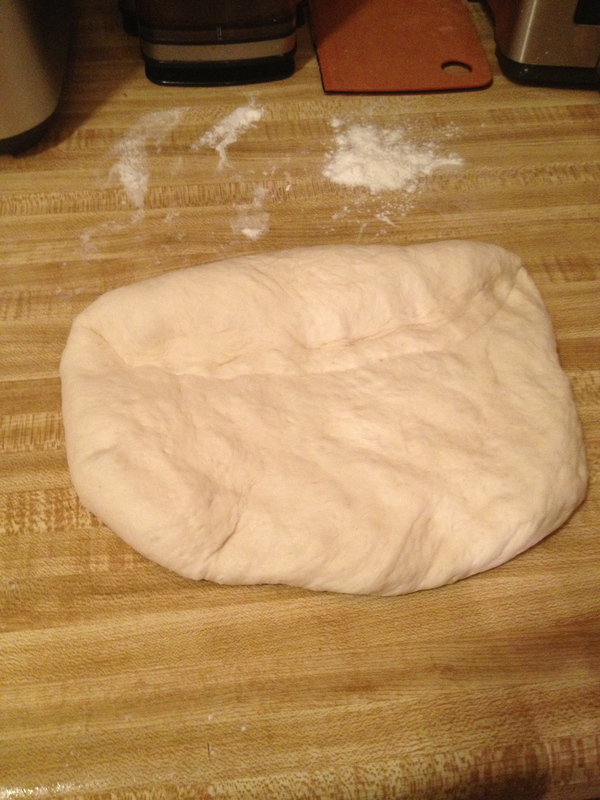 Let rest for an hour under a floured cloth. At this time preheat your oven to 425 Fahrenheit (220 celsius) with the dutch oven, cast iron, or pan in preheating as well. 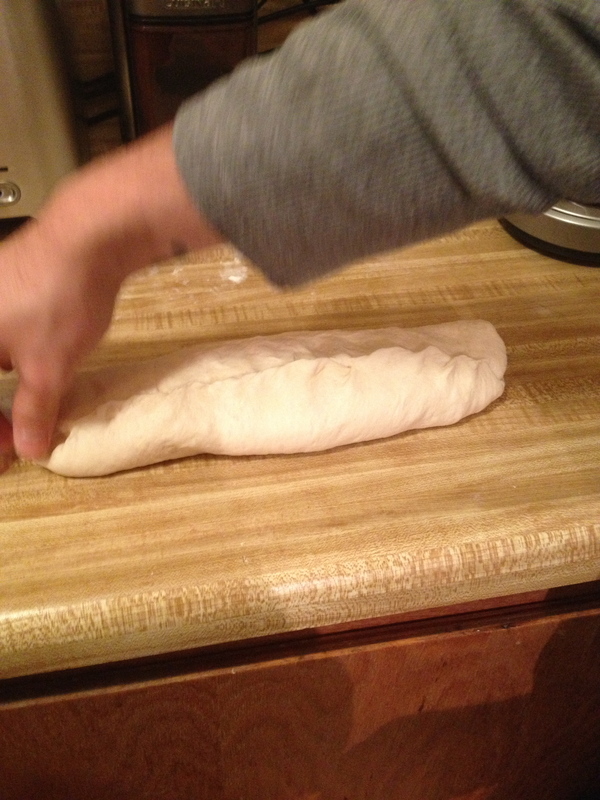 After an hour score the bread, I use a steak knife but I have had practice, be careful not to deflate the bread! Spray with olive oil and add the bread to the oven. Working quickly pour a cup of boiling water into the dutch oven (or other suitable cookware) and close the oven quickly as you want to keep the steam in the oven. NOTE: The steam can burn you badly so wear an oven mitt/ long sleeves! Set the oven for 30 min and clean up! 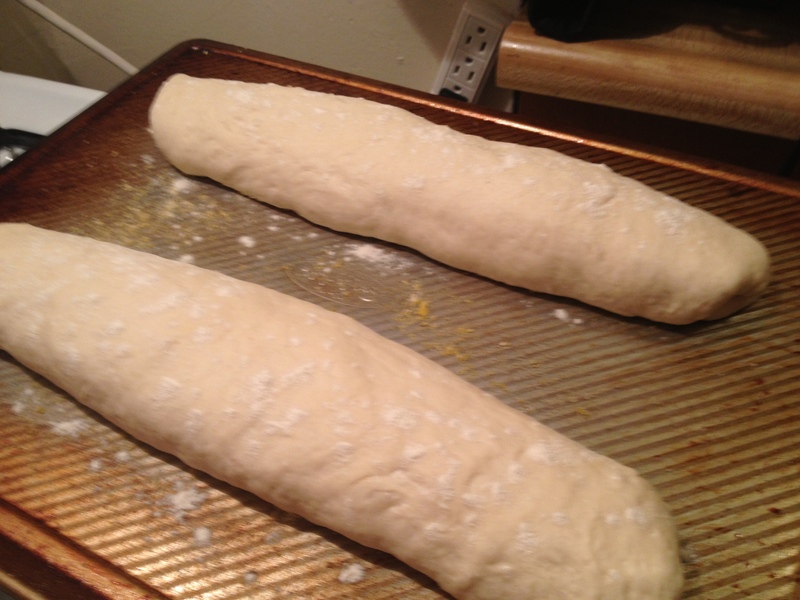 After 30 minutes take them out of the oven and let cool for a minute before transferring them to a wire cooling rack. One of the first books I received when I became a vegan was Tal Ronnen’s Conscious Cook. I devoured the recipes and savored the flavors he put on a plate. I had never heard of cashew cream or nutritional yeast before and was eager to try out all of his recipes. Some of his recipes are very time consuming, but this is one that can be whipped up in an instant for a dinner party, or just a nice way to end a cold winter day. 1. Place the Earth Balance in a stock pot over medium heat until melted. Add the onion, carrot, crushed garlic, and celery and saute for 10 min until the vegetables are tender and the onion is translucent. 2. When the vegetables are tender add the flour and stir constantly for 2 minutes. 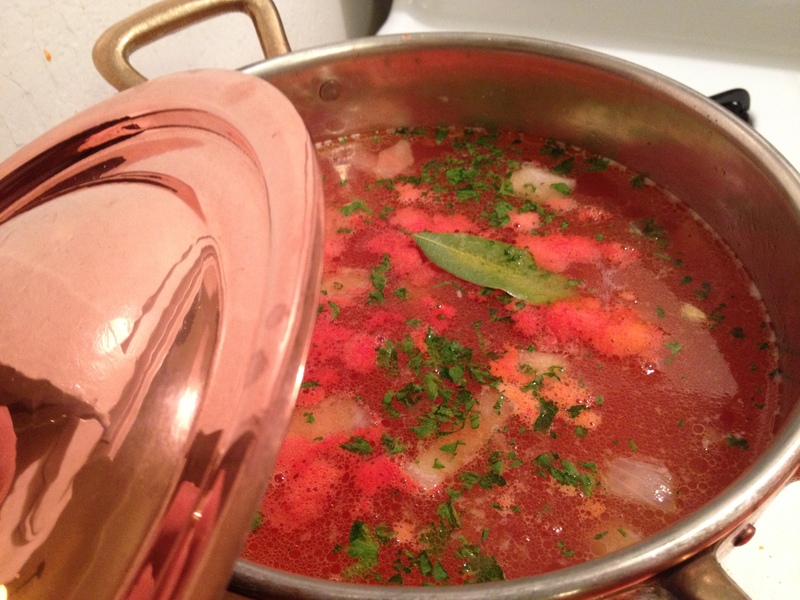 Then add the vegetable stock, tomatoes, thyme, bay leaf, and parsley and bring to a boil. Reduce to a simmer, cover, and cook for 30 minutes. 3. Open the lid and season with salt and pepper to taste. Add the cashew cream and let simmer for an additional 10 min. DO NOT BOIL. If you do you will end up with clotted cashew tomato bisque…not particularly aesthetic…but definitely tasty none the less. 4. For this step it really helps to have an immersion blender so you don’t have to transfer hot soup to the blender. Remove the bay leaf and blend until smooth. You can either run it through a fine mesh sieve or allow the thickness of the soup to absorb you, and who wants to do extra work for less nutrition? I certainly don’t! 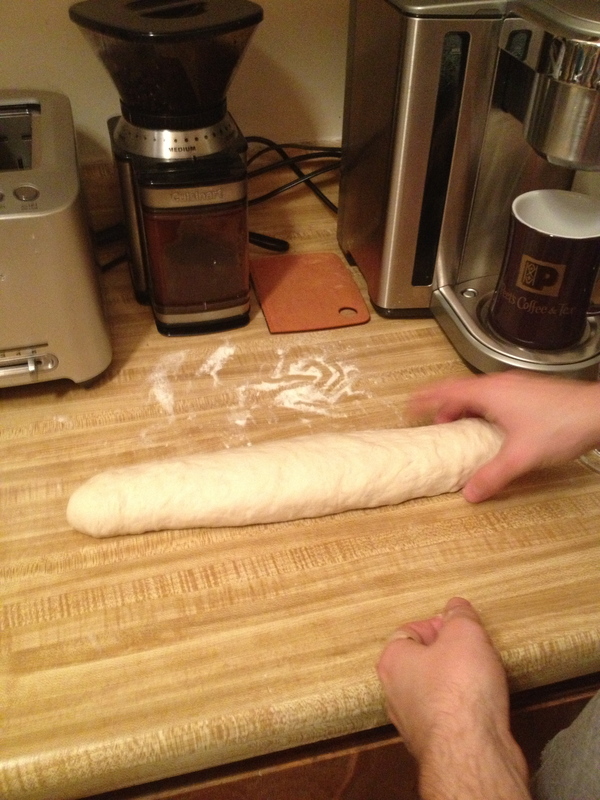 For those of you who don’t have an immersion blender, work in small batches and move the soup to a blender. Don’t overfill, I have the burns to prove this is not a wise decision even though you may be in a hurry or your guests will be arriving soon! Hold the top of the blender as the heat will try to pop it off and you don’t want a mess on the counter. Your soup will be a party hit, and veganism will have scored a point if you dare feed this to any omnivores.